In ten days, you can see the interior and exterior of the Queensland's magical Sunshine Coast Hinterland. Beginning and ending in Brisbane, this itinerary takes you through the Glass House and Blackall Mountain ranges, through historic Gympie with its gold rush past, and up to Hervey Bay, the best place to see a humpback whale. Along this journey you can dive the Great Southern Barrier Reef, tour Fraser Island, and explore the beaches of Maroochydore. A 4WD vehicle will be required to visit Fraser Island, so if you are planning on travelling here you will need to hire a 4WD camper when you book. The last two days of your trip are meant for exploring the great city of Brisbane, so if you get caught up in your travels and stay longer in other locations, you will not feel you missed anything on the route. You can always add a couple of days for sightseeing and shopping in Brisbane. Your first leg is a short one, 65-80 km depending on where you decide to stay, and which attractions you see. 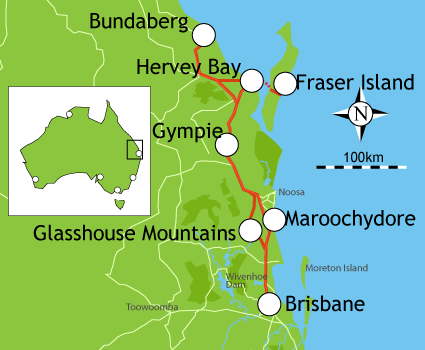 About an hour north of Brisbane is the Glasshouse Mountains Tourist Drive. This stunning mountain range was named by Captain Hook in 1770, and is an ever-present sight as you travel the Sunshine Coast. Amidst the 13 volcanic peaks is the Glasshouse Mountains National Park, which encompasses seven of the mountains. Within the National Park are four smaller parks, perfect for camping, hiking, picnicking, and rock climbing. Spend the morning and early afternoon exploring the wineries and quaint mountain villages in the Blackall Range. Drive 15 km northwest to Maleny, where you can visit the fourth-generation winemakers at Maleny Mountain Wines. Drive 15 km north (and a bit east) to Montville, where you can shop, enjoy a gourmet meal, and tour the Settlers Rise Winery. If you have time for one more, visit the Flaxton Winery, about 5 km from Montville in the town of Flaxton. Drive 76 km north to Gympie in the heart of the Cooloola Region. It was here that James Nash discovered gold in 1867, and you can learn about the Gympie Gold Rush at various attractions in town. Visit the Cooloola Region Visitors Information Center on Bruce Highway in Gympie for a fossicking permit, and then make your way to the Deep Creek Fossicking Area on the southern end of town. There are two entrances: one on Court Street and one on Victoria Street. Here you can use traditional tools to fossick for your own bit of gold. Drive about 200 km north to Bundaberg, the 'Gateway to the Southern Great Barrier Reef.' Situated on the Burnett River, Bundaberg and the surrounding areas are a nature-lover's dream, with beautiful sandy beaches perfect for diving, and eight National Parks right along the coast. In order for you to enjoy the Great Barrier Reef and other sights, you will need two days in Bundaberg. About 15 km east of the city is Mon Repos Beach, known as 'Turtle Coast,' and home to a large population of nesting marine turtles. You may be able to catch a glimpse of them after dark, so plan to come after an early dinner (check with one of the four Bundaberg Region Visitor Information Centers for the best viewing times and to purchase tickets). Drive about 76 km southeast to Hervey Bay. Named by Captain Cook in 1770, Hervey Bay is made up of numerous tiny townships, and is the gateway to Fraser Island. Considered one of the best places in the world to spot humpback whales, the area has numerous outdoor recreational opportunities, and a plethora of caravan parks. Take the ferry from Urangan Boat Harbour to Fraser Island, the largest sand island in the world at 162,000 hectares. The best description of the island is in its Aboriginal name, 'K'gari,' which means 'paradise.' Here you can explore sub-tropical rainforests, the Great Sandy National Park, 24 freshwater lakes, and Seventy-Mile Beach. Fraser Island is home to more than 200 species of birds, as well as turtles, possums, and wallabies. Numerous walking trails allow you to get up close and personal with the natural habitat. Adventures sports such as 4WD tours, snorkeling, and canoeing can be arranged at one of the many resorts on the island. You will need two days on the island, or you will feel rushed. One of Queensland's six Great Walks, the Fraser Island Great Walk is actually 85 km long and would take about a week to walk. However, there are short walks within the journey; the Queensland Parks and Wildlife Service has a complete guide to the Walk at www.epa.qld.gov.au. Make your way to the Champagne Pools on the northern end of the island, beyond the Indian Head rock formation. The spa-like seawater pools are surrounded by rocks, with soft sandy bottoms, and swimming in them is an experience you will not soon forget. The most popular lakes for swimming are the perched lakes of Lake McKenzie, Lake Wabby, and Lake Boemingen (the world's largest perched lake). Leave early in the morning and begin the 117 km-drive south to Maroochydore, where you will find gorgeous beaches and terrific shopping. The route winds through the towns of Kin Kin, Teewantin and Noosaville. If you are ahead of schedule, stay a night in Noosa Heads, just a few km off of your route. Here you will find a plethora of caravan parks, National Parks, and great shopping and beaches. The Maroochy Beach Caravan Parks are operated by the Maroochy Shire Council, and are located in Maroochydore, Mooloolaba, Cotton Tree, Mudjimba, and Coolum. Most have powered van sites and powered tent sites, laundry and shower facilities, vending machines, and swimming pools. The Coolum location, the Coolum Cool Seas, is close to beaches, restaurants, and nightclubs. The Cotton Tree location is located on the Maroochy River, and is within walking distance of beaches famous for great surfing. The Maroochydore location, the Maroochydore Seabreeze, is an oceanfront park close to beaches, and restaurants. The Mooloolaba location is across from Underwater World Aquarium, and is within walking distance of beaches and shopping. The Mudjimba location is more quiet, features a children's playground, and easy beach access. Drive 105 km south to Brisbane, the capital of Queensland and Australia's fastest growing city. Located on the Brisbane River, between the Great Dividing Mountain Range and Moreton Bay, Brisbane is a lush city with spectacular gardens and wonderful beaches. Although this is where your trip started, you are not finished by any means. Brisbane offers visitors a wealth of sightseeing and dining opportunities, and you will need at least two days to see the top sights. Once you get settled at your caravan park or resort, stroll the streets of downtown Brisbane, and have a seafood dinner or a bit of 'Mod Oz' cuisine. You will have one more full day to explore cultural and historical landmarks in Brisbane, and perhaps do some shopping at one of the outlet centers in and around the city. Situated on the banks of the Brisbane River, the Queensland Cultural Centre is a series of buildings celebrating the arts. Visit the Queensland Arts Gallery and the Queensland Gallery of Modern Art (www.qag.qld.gov.au), both with Aboriginal collections. Also in this arts complex is the Queensland Performing Arts Centre (www.qpac.com.au), where you can take a tour of the four separate theaters, and backstage areas. The Queensland Museum (www.qm.qld.gov.au/) is the place to see fossils, models of a blue whale and dinosaurs, and even a German tank from WW1.